Ukraine’s rail workers are now entering the second month of their work-to-rule action. I went to a train depot in Kyiv to find out why they're protesting. On 14 May 2018, employees of the Ukrainian state railway network started a work-to-rule action. 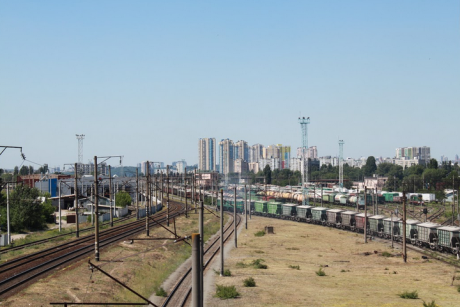 Drivers at Kremenchug, Kryvyi Rih, Darnytsa (Kyiv) and other rail depots refused to drive trains that do not meet safety requirements, which in turn has led to the interruption of freight traffic on whole sections of the rail network. After all, there are practically no other rail networks in Ukraine. Difficult working conditions, low salaries and the removal of preferential pensions have led to people quitting their jobs on the railway en masse. Since 2014, the number of workers at Ukrzaliznytsia has been reduced by 30%, and overtime has become a commonplace. I visited the Darnytsa Locomotive Depot on Kyiv’s left bank to find out how railway employees work and what they are fighting for. It’s not easy to get to Darnytsa Locomotive Depot. It’s located in the vast industrial zone somewhere between the Darnytsa Car-Repair Plant and Novaya Darnytsa. But this is where Kyiv’s main transport hub is located – everyday, locomotives from Darnytsa run freight cars through Kyiv. 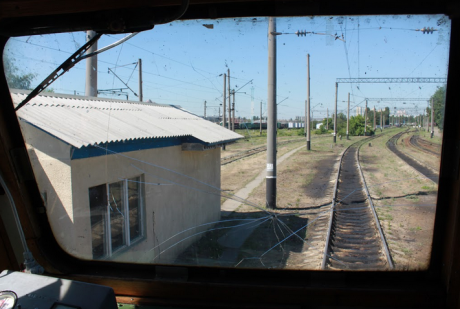 But on 14 May, together with their colleagues from Kremenchuk, Kryvyi Rih and other train depots throughout the country, drivers refused to leave the depot. This is when their “work-to-rule” action began, and it’s still going on today. I meet Alexander Skiba, Head of the Free Trade Union of Railway Workers of Ukraine (VPZU), as I make my through the winding tracks of the Darnytsa depot. When I ask how many trains can operate if all safety instructions are followed, Skiba responds easily: “Not a single one, I think.” According to Alexander, all trains have problems with leaking oil. 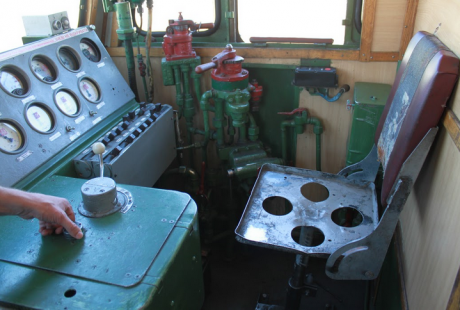 In the cabs, approximately 90% of the windows are broken or cracked, there are safety violations, and 50%-60% of the locomotives lack basic means of electrical protection. There are no grounding rods, and the protective gloves are worn out. All this is more than enough to stop a locomotive from leaving the depot according to the official rules. This campaign began because, as Alexander says, “we’d had enough”. It’s difficult to say what exactly triggered the protests: “Here is a chair. Which chair leg is more important? Take one away and everything falls down.” Yet still Alexander acknowledges the main issue – a wage increase for railway workers. Sergey agrees with him – he’s a locomotive driver from Kharkiv working at Darnytsa Depot, whom we meet the next day in the park next to Darnytsa station. According to Sergey, the salary at the Darnytsa Depot is one of the lowest across Ukraine’s south-western rail network. And although official organisations and the “yellow” trade union stated at a meeting with Ukraine’s Minister of Infrastructure that the monthly average salary for locomotive drivers amounts to 18,000-20,000 UAH (£520-£580, an impressive amount for Ukraine), Sergey received this amount only once in his life. And that was after working almost double overtime. Indeed, the way the “average” salary is calculated raises a lot of questions for him: “Maybe this is the gross sum? But I can’t take my gross salary to the store and can’t use it to pay my gas bill,” says Sergey. The situation with overtime is made worse by the drivers’ working conditions. In summer, when the temperature outside rises above 30 degrees, in the cab (many of which are already 50-60 years old) temperatures can reach 50-60C, and in the engine compartment – up to 80C. You can get burned if you touch the train’s exterior. “You drink three litres of water and never go to the toilet on a single run. Over the summer season your jeans just fall apart. They are always wet from the constant dampness,” Alexander complains. Drivers aren’t allowed to place air conditioning units in the cab: temperature extremes in the cabin and engine compartment can easily cause illness. After these exhausting shifts, drivers are entitled to rest. But because of overtime, time spent at home is reduced to a minimum. And for some professions, such as a training driver, time off can be less than 24 hours. “What do people have time for in life? Nothing! My father says to me: ‘Why do they pay you money? You make sandwiches at the station you arrive at, pay 1,000 hryvnya for cigarettes, and all the same you don’t get to spend any time at home,’” says Sergey. And if experienced drivers are ready to work like this, younger drivers don’t stay for long. “If you chose the railway, you don’t belong to yourself anymore. You belong to Ukrzaliznytsya. And the railway does with you whatever it wants,” Sergey concludes sadly. Despite the difficult working conditions, strict requirements from management and almost no free time, drivers are still an elite group inside Ukraine’s railway network and have the ability to influence management. But for a train to get outside the depot, the driver alone is not enough. This is the result of a big number of people – mechanics, machinists, shunting workers, station workers. And these people remain the invisible and the most undervalued workers on the railroad. Mechanics gets 3,500-4,600 hryvnya net pay (£100-£133). The nurse in the first-aid post gets 4,000. The duty officer at the station – 4,500. How can these people make their utilities payments on this money, one can only guess. As a result, there are almost no people brought up in Kyiv working in Darnytsa depot anymore. But it is no easier for others. Every year there are fewer and fewer people ready to work for this money, and this directly affects the operation of the whole enterprise. According to Alexander Skiba, sections from Teterev to Svyatoshino or from Trypillya-Dnipro to Petro Krivonos severely lack shunting masters. To get a shunting master capable of forming a train, sometimes it is necessary to drive him down on a train, which, in turn, leads to downtime. And downtime equals money. “We had to spend two and a half hours on the section Fastov-Bela Tserkva, waiting for the shunting master to arrive from Fastov. One more train had to wait due to this. Imagine: the delay of two trains. This is huge money! And the shunting master gets 5,000-5,500 hryvnya a month. Give him 2,500-3,000 more, and the trains wouldn’t have to wait,” Alexander tells me. Representatives of the trade union believe that the policy of making savings on workers affects the entire railway. Meeting the demands of the work-to-rule action would only increase the efficiency of the enterprise and reduce the cost of transportation. Giving all their time to work on the railroad, drivers could, until recently, at least count on early retirement – at the age of 55. But after a 2016 reform, Ukraine’s Cabinet of Ministers has radically reduced the list of occupations with particularly harmful or difficult working conditions – the so-called “List No.1” and “List No.2” – and locomotive drivers were excluded from these lists. For railway workers, getting this profession back onto the preferential pensions list is a key requirements. Alexander admits that unfortunately, it wasn’t possible to stop operations at Darnytsa. Strikebreakers and redistribution of cargo to other deports filled in for the shortage of workers, who agreed to run on routes in faulty trains. According to rumours, the first strikebreakers even got paid a one-time premium – one month’s salary. And not everybody supported the campaign in Darnytsa. “The first to go were instructors,” Alexander tells me. “They were collected from their homes on the first day, and they set off. Then the older workers.” And although many people in the depot silently support the strike, they are not ready to go against management. Nevertheless, the campaign that started on 14 May was not a waste of time – it even managed to spread to other depots. Now 11 locomotive depots are involved in work-to-rule actions.The management of Ukrzaliznytsia has been forced to negotiate under this pressure. So far, unfortunately, to no avail. “They are bargaining,” Sergey describes the negotiations. “Once we came out from negotiations at the Ministry, we hadn’t agreed to their proposal. We hadn’t gone far – they phoned us. Let us give you this option. Come back.” Minister of Infrastructure Volodymyr Omelyan stated that, in the current situation, he cannot interfere the work of the state enterprise and offered himself as an arbitrator. On the other hand, as confirmed by representatives of independent trade unions, the most numerous Trade Union of Railway Workers and Transport Builders of Ukraine did not support the protest officially (unlike many rank-and-file members) and completely shifted to the side of the employer. The railway’s general management is more ready to lose money on downtime and exercise pinpoint pressure on protesters rather than make any serious concessions. After a month of struggle and negotiations, the situation seems to have reached a deadlock. This text is published as a part of Political Critique's “Invisible Labour” project, implemented with the support of Rosa Luxemburg Stiftung Ukraine.